This article is yet another well-written, thoroughly-researched piece authored by Dale K. Myers, which once again illustrates his tremendous ability to get to the facts of a particular JFK-related subject, while systematically and step-by-step stripping away the nonsense that is continually being purported by the various JFK theorists. Nice job, Dale (once again). Kudos to Todd Vaughan too. He's listed as co-author of this article. I shouldn't have left him out of my comment above. I agree with David. Dale has done us a great service by providing clear, coherent analyses of both the Tippit murder and the JFK shot sequence. Dale and Todd: Thank you very much. I cannot think of any reason why Oswald would wait until his target was approaching 1/3 to 2/3 of a football field away before taking his first shot. It certainly makes sense that a much closer shot was desirable. After visiting Dealey Plaza it was apparent from standing on the sixth floor looking down on Elm Street that at a steep angled shot would be necessary at or near the traffic light post. If a shot is taken at a steep angle at close range the shot would require under hold because of the bullet going higher than the point of aim. Secondly, depending on Oswald’s sight in distance for his scope (e.g., 50 or 100 yards) the bullet would travel a parabolic arc to the point of impact and at distances closer than the sight in distance the arc would be higher (i.e., overshooting). The ammunition for Oswald’s rifle had an initial velocity of about 2200 ft/sec which is rather slow and would require an adjustment for elevation at a short distance somewhere around 1.0 to 1.5 inches (meaning a lower hold). The failure to correct for the steep angle and scope setting certainly could have caused Oswald to miss his first shot (aiming perhaps 2 to 3 inches to high), however, looking through his scope the cross hairs would look on target but in reality the aim point possibly could be a pole, tree limb etc. Actually in the Zapruder film there is an almost simultaneous leftward head turn of JFK, Mrs. Kennedy, Secret Service Agent Hickey and Texas Gov. 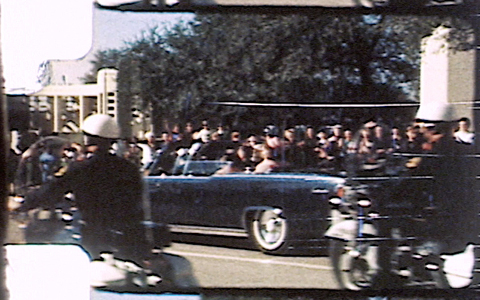 Connally visible in Zapruder frames 140 to 149. The time of this event was within ½ second of each other suggesting a common cause (i.e., gunshot). A flinch reaction to a gunshot would be almost immediate (on the order of ¼ second); however, a reaction of ‘what just happened’ would be much longer (on the order of 2 to 3 times). If that is the case, then the first shot would be before 155 and more nearer the start of the Zapruder film. This is what convinced me that Oswald certainly could have shot accurately 3 times in a matter of 8.0 to 11.0 seconds (instead of 3 to 4 in WC report)and away from the conspiracy theory. Actually, an early shot would have been the most difficult because Oswald would have to track his target from left to right and at a considerably steep angle. One the many reasons why it made more sense to wait until the car was further down Elm Street when it would have been moving directly away from the sniper position. As for a first shot miss, Oswald missed the entire 21 foot limousine which means that his shot (whatever the reason for the miss) didn't have anything to do with the settings of the scope. Finally, there is no compelling Zapruder film evidence in the 133-155 range that suggests a shot earlier than Z155 - including your claim that such evidence exists in the 140-149 range. Compare all of the films and photographs taken before, during, and after your cited time range and it is clear that the actions of the principles you name are not in fact exhibiting a reaction to a severe external stimulus but merely following through with actions begun previously in response to the crowd on both sides of the street. Yes, Oswald had plenty of time to get off three shots in 8.3 seconds, however, a shot earlier than Z155 is not required to accomplish this feat, nor is there any compelling photographic, eyewitness, or physical evidence to support such a notion - which was the point of the three articles rebutting Holland's theory. Here's an unpicked cherry: in "Whitewash," Harold Weisberg noted blurring of the Zapruder film, beginning at frame 190. He attributed it to Zapruder's reaction to a shot. The HSCA's photographic experts discovered blurring at frames 189-97 and 312-34. If you assert that a shot was fired before frame 189, as Holland does, you have to explain why Zapruder didn't react to it. A couple of things to keep in mind: The blur analysis fails to take into account that blurs could have been caused by external stimuli other than auditory ones. 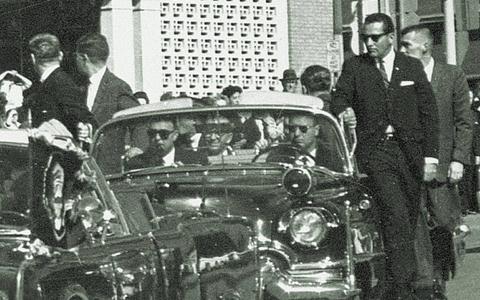 In addition, Holland postulates that the first shot was fired before Zapruder began filming. The best evidence that LHO switched direction is that he did the same thing twice later, ducking into Brewer's shop, and sneaking into the movie theater, each time drawing attention for suspicious behavior, and each time in response to a cop car driving by. 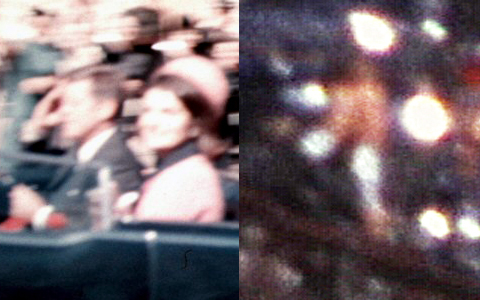 Holland and Scearce's most publicized evidence of the first shot occurring just before Zapruder resumed filming (aside from the ricochet being the most plausible explanation for how Oswald missed a 21-foot long car) was the near simultaneous (within .5 seconds) left head turn of Kennedy, Connelly, Mrs. Kennedy, and agent Hickey in Z frames 140-149. I've seen the film and it's quite obvious that this occurred. Yet, in your blog above, you never mention this simultaneous head turn. Instead you focus on the head and body movements of the secret service agents in the trailing car. Only when "merbeau" above mentioned these head movements in 140-149 did you address it with the rather vague "following through with actions begun previously in response to the crowd on both sides of the street." Why all the detailed attention on the movements of the occupants of the trailing car and little or no attention to the Kennedy's, Connelly, and Hickey, in Z 140-149? This subject has been dealt in multiple articles on this blogsite. (Search: Holland) In particular, the Z140-149 head turns and my response in the comments section of the Dec. 4, 2008 article above, were addressed in considerable detail a year earlier (in the Dec. 20, 2007 article: Holland Déjà Vu). You must have missed it. Thank you for your prompt response. Also, thank you for all of the hard work you've done to put to rest some of the ridiculous conspiracy theories that a large proportion of the American public can't seem to let go of. Please bare with me and I'll get to my question. If I understand this correctly, the Zapruder film runs at 18.3 frames per second. 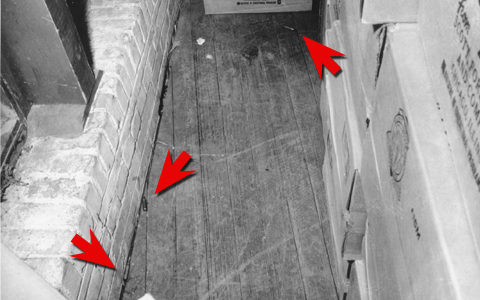 You (and many others) believe that the evidence suggests that Oswald took his first shot around frame 156 (155-157). 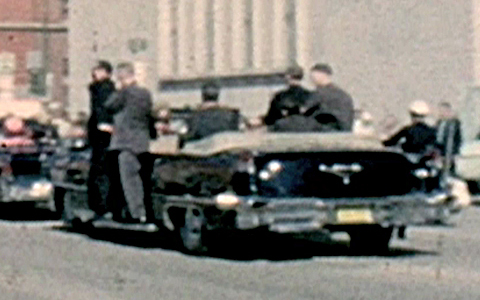 Holland, Rush (and some others), believe this first shot occurred an instant before Zapruder resumed filming at frame 133. Depending on reaction time, which can only be approximated, I believe this means that the dispute is over a period of 1 to 2 seconds. Given this narrow window, and the unreliability of eye and ear witness testimony, it's understandable that each of you is able to cite examples of testimony that seem to support your claim. Sometimes, both sides even cite the same testimony, combined with still photographs and film clips, as evidence that the other is wrong. I think it would be fair to say that this will never be resolved using witness testimony. Each of you can also cite frames and sequences in the Zapruder film that seem to support your claim so, again, nothing definitive that I can see. Holland et. al examined the actual traffic mast and acknowledged that they didn't find anything (other than a rust spot) that was evidence of a bullet ricochet. Given the passage of time (rusting and painting) this neither proves that it did or didn't happen. They also did some ballistics testing which seemed to me to be inconclusive. Taken in sum, I would say that neither the 156 nor the pre-133 group can definitively prove its point based on testimony, photographs, or films. This brings me, finally, to my question. Oswald delivered two devastatingly accurate shots (2 and 3) at the presidents upper back and head at long range, but at short range, he missed the broadside of a 21-foot long limousine as it traveled right past him from left to right. I've never fired a gun, but these facts are very difficult to reconcile. To have missed Kennedy, maybe, but the entire car? 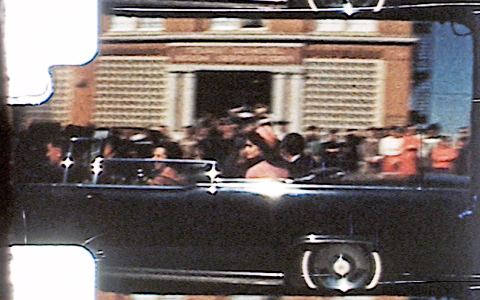 Given the location of the limousine at frame 156, is it possible to estimate the minimum displacement of the barrel from the center of Kennedy's body to produce a miss that didn't even hit the car? I think you've missed the point about my dissertations on Holland's theory - or any theory for that matter - that seeks to upset the proverbial apple cart without offering believable evidence to support that theory. As I have demonstrated again and again in the seven articles on this blog site, Holland has failed to offer anything that is believable (eyewitness testimony or more importantly physical evidence) to support what he claims everyone has missed. Eyewitness testimony is subjective, however, when combined with films and photographs one can reconstruct reality with a reasonable degree of certainty. Holland's efforts have been botched at best. I'm not going to argue with someone over what might have happened during a two second interval, but I will argue all day long with someone who attempts to reconstruct their own reality based on a skewed version of eyewitness testimony, photographic images, and scientific evidence. If you're going to claim to re-write history, do it using the puzzle pieces we have, not a handcrafted set of one's own making. Holland's theory offers nothing new to the assassination story and by his own admission has no physical basis in reality. Forensic ballistic experts Luke and Michael Haag have proven to my satisfaction that Holland's theorized ricochet off the mast post is impossible as speculated. They've done the real world tests and posted the results. So, it's little wonder that Holland could find no physical evidence for an impossible ricochet. As for Oswald's first shot miss, who knows? There are a million-and-one reasons why he missed. Pick one. The only thing that can be said for certain is it did miss. Thanks for sharing your thoughts. Sounds to me like the author of this article is a bit put out that Holland may have the very thing that makes any sense after all these years. Common sense alone makes a person ask, how could Oswald miss the whole car? In 50 years of my own research,. Holland's view makes more sense than anything I have heard regarding the missed shot. A theory requires actual evidence otherwise it remains an unsubstantiated/unsupported theory, yes? In this case, as the authors have shown time and again, there is no evidence - neither testimonial nor physical - that supports Holland's theory. Even Holland himself acknowledges (after careful examination of the original mast pole) that there is no physical evidence that an errant bullet actually struck the mast pole in the manner that he theorizes. Other forensic experts (the Haag team) who have also examined the original mast pole not only agree but have made the convincing argument (backed up with scientific evidence and demonstrations) that such a theory is forensically impossible under the circumstances. The authors concur. Search "Holland" on this blog for a series of related articles.